1. Tell us about your route to publication of your debut novel, Anyone for Seconds? I started writing in earnest about five years ago and in that time have written four books. The first book I wrote was called Ripped Genes and it was written in quite a serious vein with a few laughs. I sent it away to a few publishers and agents both in Ireland and the UK and although it was rejected the feedback I received was very positive as they all commented on my wit and comedy timing. 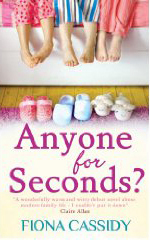 As a result I decided to write a brand-new book in a contemporary humorous style and that’s when things began to happen and subsequently Anyone for Seconds? was born! I only sent it to one publisher, Poolbeg Press, and within nine months I had signed a three-book deal, had my first book published and saw it become a top 10 bestseller within two weeks of publication! Ripped Genes has now been re-written and is coming out under the new title Anyone for Me? and will hit the shelves in August of this year! 2. What inspired you to begin writing? I’ve always been a passionate reader so for me it was a natural progression to want to write my own novel. I always loved English and did it until A-Level in school and had ambitions to become a newspaper journalist. I had actually been offered a place to complete a journalism degree at a university in Edinburgh but unfortunately wasn’t in a position to accept it as I got pregnant with my son Colm when I was 18. The ambition never went away, however, and continued to bubble under the surface whilst I raised my family and held down a full-time job until I eventually started to write a story one day and haven’t stopped since. 3. What response do you want your writing to evoke in your readers? Above all else I’d like my readers to be able to identify with my storylines and have a laugh. Anyone for Seconds? is loosely based on my own experiences using fictional characters and plots and explores a lot of issues that modern people face from single parenthood, having a step-family and starting a second family with a new partner. I like to tackle serious issues but in a humorous and funny way as I employ the philosophy in my own life that if you didn’t laugh you just might cry and that’s definitely the wrong option! 4. Tell us about your writing routine. Erm…what writing routine??? As a busy mammy with five children my routine consists of me writing when I have time and can get peace to concentrate! I usually try and work when my older children are at school but as I have a demanding three-year-old to care for during the day the amount I get done can vary. I’m very lucky though as I have very supportive parents and a wonderful partner who help out when they can. Some of my best work is done late at night when there is no noise or distractions. 5. What advice would you give the aspiring writers? Writing is a tough business to break into and rejection can be disillusioning and soul-destroying but my ultimate piece of advice to those who have ambitions to write is never to give up. Listen to the feedback you’re given from agents and publishers and concentrate on your strengths. Attend creative writing classes, join online forums and surround yourself with like-minded people who you can share experiences with and learn from or get advice from a professional who offers manuscript critique as part of their services. 6. It’s being said that at the moment the women’s fiction genre has never been more competitive. How do you make sure your writing reaches its target audience through marketing? As well as having a great publishing team and very supportive agent I’m also in the lucky position of being able to use my own life experiences to market and publicise my work. As a former single parent and now a step-parent I think it appeals to the public and press alike that I write about what I know and have lived through some of the events I wrote about. My next book Anyone for Me? is all about an adopted girl searching for her real mother and as I’m adopted myself again I have drawn on my own experiences which people find interesting! The bookshops and media locally and nationally have been fantastic as well and I owe them all a debt of gratitude. 7. Who is your favourite chick-lit heroine? There are so many to choose from. I love Becky Bloomwood from the Shopaholic series and the Walsh girls from Marian Keyes’ books but I think my ultimate favourite heroine has to be Emma Hamilton from Sinead Moriarty’s From Here to Maternity trilogy. Those books got me through a tough pregnancy and I loved them! 8. What’s your opinion on the future of the publishing industry? Do you think e-books are the way forward? I can’t speak for others but for me there’s nothing in the world like falling asleep with a book in your hand. It would be rather painful to wake up head first in a laptop screen! That aside, I love the feel and the smell of books and going into a bookshop to pick one is all part of the fun. However, in the modern day and age we live in, where people are so busy, e-books may well catch on but I certainly won’t be giving up on the ‘real thing’. 9. What’s the best writing tips you’ve ever received? ‘Show not Tell’ is a great concept that I learnt about when penning my first novel which basically means that you’re letting your characters tell their story through action and dialogue instead of the author being a narrator the whole way through the book which makes it more exciting and interesting for the reader. 10. What do you know now that you wish you knew when you started writing? In all honesty I wouldn’t a change a thing. I could say that I’d like to have known that all my dreams would eventually come true or that I’d have liked to have found out about various contacts or what formula was required to write the book that finally got published. However, looking back I’m glad to have had the experiences I’ve had because they’ve helped me fully appreciate what I’ve achieved and made it all the more special! 11. Can you ever see the chick-lit market imploding, or do you think there will always be a place for it? There will always be a place in the market for contemporary women’s fiction therefore I can never see it disappearing. It will continue to evolve with the times and produce new talent in the same way it has done up until now. 12. What do you think about celebrity writers? What influence do you think they’re having on the publishing market? I don’t have a problem with anyone writing a book. Anyone who has a literary talent deserves to be published. However, it does annoy me when celebrities who quite obviously can’t write and have to rely on their fame and the talents of others in order to have books published appear on the shelves and gain massive advances and royalties. To my mind they belittle what myself and a lot of other writers have struggled to achieve as unknown authors. That said, though, there are some good celebrity books out there and it would be unfair to criticise them all as a group because of the actions of a few. 13. What are you working on at the moment? I’ve just finished editing Anyone for Me? which is currently at the typesetters and due for release on August 2 and am about to get back to writing my third novel which at the moment has a working title of Anyone for Sangria?